There isn't much better for a Dodger fan than watching his team clinch a division title at home against a storied rival like the Giants. It's one of those moments where you remember where you were and exactly what you were doing when it happened. No post game show. No view of a pool party. No footage of players squirting champagne at fans. No chance to watch the Giants wallow into their dugout away from the celebrations. No bubble machines, not even more than a little taste of the Division Champions shirts being passed out. I was alone with my thoughts in this town of sleeping soccer crazed fans. Though the hotel here at the Sheraton has about a dozen sports channels, my scan through them showed about 8 dedicated to soccer, one to formula 1 auto racing, another to cycling, and an NBA channel showing an old game with Charles Barkely playing for the Suns in the 1990's. That was it. I couldn't share the moment with anyone. All I could do was turn off the light and go to sleep. And how was I going to sleep after that? Kershaw won his 21st. Puig with a clutch homer and another amazing assist. Crawford tearing things up again. It was too much to absorb. Too much excitement going on, but on the other side of the world. (NOTE: I fly back to the States tonight...and being in DC, I'm hoping to be able to catch a Dodgers-Nationals NLCS game or two in the coming weeks). There never has ever been a better chance for a "Freeway Series" to take place this year. Maybe I'm jumping the gun, but a Dodger-Angel World Series I believe is in the cards in 2014. We all know anything can happen in the post-season, but the stars seem aligned for it this year. What an event that would be! So it's time to speculate who makes the initial NLDS roster. In a best of five series, do the Dodgers go lighter on pitching? I say "yes" with only 11 pitchers on the roster. I also favor having a second lefty in the bullpen (e.g. Paco) over Chris Perez, who has been steady lately. Okay, I've been sick. About as under the weather I have felt in years. 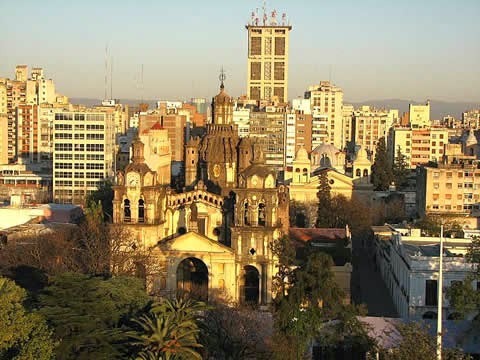 The OKP blog has been stagnant now for 14 days as I have traversed the continent on training assignments and as I write these words, I'm sitting in a hotel room at the Holiday Inn in Cordoba, Argentina, preparing for a weeks worth of class material to be given to Argentinian Customs officers. Work has kept me from the blog, which was something I advised readers of back in April. 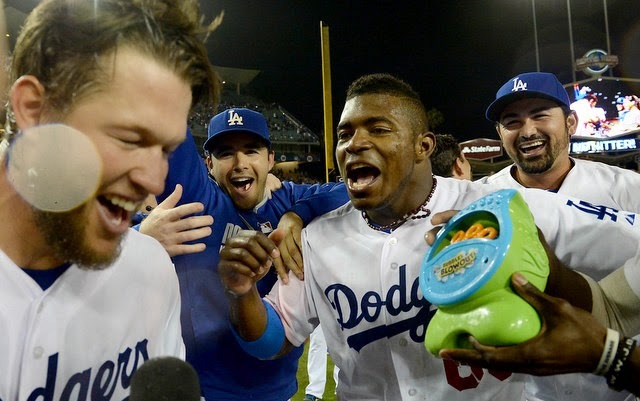 Things haven't changed either, as the Dodgers are gearing up for what may be their most exciting post season in years, I'm trotting the globe and preparing lesson plans as I never had before. So I caught some type of bug in Bogota, Colombia last Thursday, the day that I departed that country. Three consecutive nights I have tossed and turned with chills, fever, sweats, no appetite and constant other issues that I'd rather not discuss. Such is the life for an international traveler, and I don't even finish this South American Journey until September 26th. But you know what the best medicine is for the symptoms I described above? How about 17-0 and 4-2? How about a lead at 3.0? Or a Magic number of 11. Yeah, those are the antidotes for the worst case of Montezuma's Revenge that I've ever felt. Yes, taking down the Giants in their home yard allowed me to forget all the misery of the last few days and for a few precious moments I could savor sweet Dodger fruits of victory a full 6,082 miles from the site due to the magic of MLB.com. 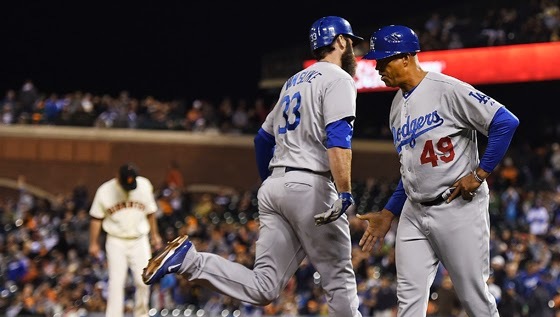 Scott Van Slyke rounds third after homering in Saturday night's action, a 17-0 win over San Francisco. The hoots and hollers from the gringo in room 109 came from me. As I walked through the hotel and saw others in the lobby bar gathered around a plasma with soccer on it, I came to realize that I just may be the only person in this city of a million plus that even cared about the Dodgers/Giants. I'm sitting here at the foot of the Andes, 6,000 miles from home. Weak from exhaustion, sick and thin as a rail with a big freaking smile on my face. Thank you Dodgers. Thank you for healing this ailing traveler. Man, baseball can be so awesome!